The opening ceremony for our representative office in Bangladesh was held at a hotel in Dhaka, Bangladesh, on November 27th, 2018. The opening ceremony was attended on a large scale by representatives of the Bangladesh Investment Development Authority (BIDA), the Embassy of Japan in Bangladesh, and Japan International Cooperation Agency and other organizations, as well as representatives from agencies and Mitsubishi Electric Corporation. Motokazu Inaba, president and CEO of Setsuyo Astec Corporation, gave the opening speech, and this was followed by speeches by Kazi M. Aminul Islam, Executive Chairman, Bangladesh Investment Development Authority (BIDA), Hiroyasu Izumi, Ambassador Extraordinary and Plenipotentiary, Embassy of Japan in Bangladesh, and other guests, and the ceremony ended on a high note. In addition to carrying out timely market surveys and collecting information in Bangladesh, Setsuyo Astec intends to improve the level of detailed support and services we provide customers by supporting local sales agencies. 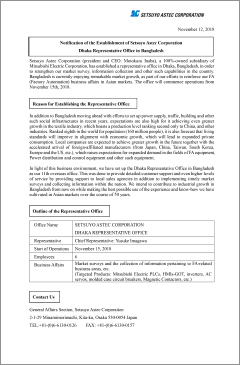 The Bangladesh Representative Office represents the eleventh overseas office that Setsuyo Astec has established in Southeast Asian nations and regions. We will continue to contribute to the industrial growth of Bangladesh by making the best use of the experience and knowhow we have accumulated over the course of fifty years in Asian markets. Hideaki Kojima, Managing Director, Chief Representative of Dhaka, MUFG Bank, Ltd.
Momtaz Bhuiyan, Chairman, NewVision Solutions Ltd.
Setsuyo Astec Corporation (president and CEO: Motokazu Inaba), a 100%-owned subsidiary of Mitsubishi Electric Corporation, has established a representative office in Dhaka, Bangladesh, in order to strengthen our market survey, information collection and other such capabilities in the country. Bangladesh is currently enjoying remarkable market growth, as part of our efforts to reinforce our FA (Factory Automation) business affairs in Asian markets. The office will commence operations from November 15th, 2018. The opening ceremony for the Mitsubishi Electric – Setsuyo Automation Experience Hall was held in New Taipei City, Taiwan, on September 27th, 2018. The ceremony was attended on a large scale by representatives from the Ministry of Economic Affairs, Smart Machinery, the Industrial Technology Research Institute, the Taiwan Electronic Equipment Industry Association (TEEIA), the Taiwan Automation Intelligence and Robotics Association (TAIROA), various machine manufacturers and distributors, and Mitsubishi Electric Corporation. Motokazu Inaba, president and CEO of Setsuyo Astec Corporation and Setsuyo Enterprise Co., Ltd., gave the opening speech, and this was followed by speeches by Mr. Hua-Yu Lin, director of the Metal and Mechanical Industries Division, Industrial Development Bureau, Ministry of Economic Affairs, and Mr. Ta-Hsin Chou, Ph.D. deputy general director of the Mechanical and Mechatronics Systems Research Laboratories, Industrial Technology Research Institute, which was followed by an introduction of the e-F@ctory concept by Hsin-Fu Chen, assistant section manager of the Setsuyo Enterprise Sales Department. The newly-established Automation Experience Hall not only contains a demonstration exhibit introducing the technologies involved in Mitsubishi Electric FA equipment and power distribution and control equipment as well as the products manufactured by affiliated partners, it also incorporates FA training school classrooms and equipment evaluation laboratories. We intend to continue providing suggestions for solutions and even better services that contribute to our customers’ manufacturing initiatives via the Automation Experience Hall amid the globalization of the manufacturing industry, which is sure to accelerate even further in the future. 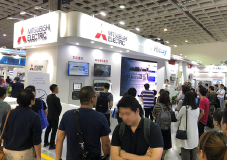 We operated booths at the Taipei Int'l Industrial Automation Exhibition 2018, the Taiwan Automation Intelligence and Robot Show 2018, and the Smart Manufacturing & Monitech Taiwan 2018 trade fairs held in Taipei in August 2018, at which we provided practical solution demonstrations with e-F@ctory and Mitsubishi Electric's latest FA equipment as IoT solutions for the smart-machinery that the government of Taiwan is advocating. More than 800 companies operated booths showcasing automated control facilities, robots and other recent products at the Taipei Int'l Industrial Automation Exhibition 2018. 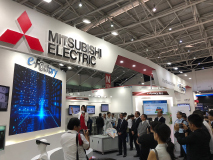 Our booth demonstrated data analysis, etc., with MELIPC with Edgecross and robots equipped with Mitsubishi Electric’s “Maisart” AI technology, and approximately 2,000 people visited the booth. We showcased various robot technologies at the Taiwan Automation Intelligence and Robot Show 2018, a trade fair for automation technologies and robotic technologies, and presented products and manufacturing equipment based on the theme of smart machinery and artificial intelligence at Smart Manufacturing & Monitech Taiwan 2018, a trade fair for management/monitoring systems and remote operation technologies, etc. We exhibited solutions with the use of Mitsubishi Electric FA equipment and the products manufactured by affiliated partners, and our product explanations using demonstration equipment were very highly acclaimed. We would like to extend our gratitude to the many people who visited our booths. 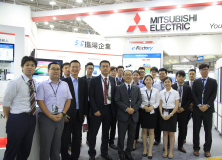 *) We jointly operated booths with Mitsubishi Electric Taiwan Co.,Ltd. at Taipei Int'l Industrial Automation Exhibition 2018 and Taiwan Automation Intelligence and Robot Show 2018. Mitsubishi Electric Factory Automation Systems Group and Setsuyo Astec presented sets of technical training materials of their Mitsubishi FX-PLCs, HMIs-GOTs, inverters, energy-saving equipment, and photoelectric sensor by OPTEX FA CO., LTD. to the Norton University in Cambodia on June 29th, 2018. The donation ceremony was attended by Embassy of Japan in Laos, Japan International Cooperation Agency(JICA), university officials and students from the university, our local distributor, DHINIMEX CO.,LTD, as well as members of the press (print) , Mitsubishi Electric Corporation and our company and the grand event was graced by the presence with about two hundreds of participants. Norton University, which is located in the capital of Phnom Penh, is the first private university established in Cambodia. By providing both theoretical education and practical training, university produces competent technical experts and contributes to the development of the industrial sector in Cambodia. This has been for the first time the university received Mitsubishi Electric FA equipment. Mitsubishi Electric Factory Automation Systems Group and Setsuyo Astec presented sets of technical training materials of their Mitsubishi FX-PLCs, HMIs-GOTs, inverters to the National University of Laos and presented sets of Mitsubishi FX-PLCs to the Polytechnic College on June 4th, 2018. The donation ceremony was attended by Embassy of Japan in Laos, university officials and students from the university, our local distributor, AROUNKIT CORPORATION, as well as members of the press (print) and our company and the grand event was graced by the presence with about scores of participants. National University of Laos and Polytechnic College, which is located in the capital of Vientiane, is the leading technological university in the country. By providing both theoretical education and practical training, both university and college produces competent technical experts and contributes to the development of the industrial sector in Laos. The company jointly operated a booth with our local distributor, ELECTRO MECH AUTOMATION & ENGINEERING LTD., at the Safe Materials, Equipment & Real Estate Segment of Bangladesh (SAFECON) 2018 held at the Bangladesh International Conference Center (BICC) in Dhaka from May 10 to 12, 2018, showcasing Factory Automation Systems Group of Mitsubishi Electric Corporation equipment (PLCs, inverters, HMIs-GOT) and power distribution and control equipment (breakers, relays and magnetic contactors). SAFECON2018 is a comprehensive exhibition for safe and sustainable construction, building materials, method, and equipment in Bangladesh, and this year represented the 3rd time. The exhibition was participated by approximately 90 companies and organizations from home and abroad and the atmosphere within the booth remained upbeat throughout the event, attracting a large number of visitors. This represented for the first time that we have operated a booth showcasing Mitsubishi Electric equipment at this exhibition. On February 23, 2018, Setsuyo Astec presented five sets of Mitsubishi FX-PLCs, HMIs-GOT, inverters, and induction motors to the Institute of Engineering and Technology in Mongolia as training materials under the sponsorship of the Factory Automation Systems Group of Mitsubishi Electric Corporation. The presentation ceremony was attended by Sergelen Munkh-Ochir, President of the Institute of Engineering and Technology; Otgonbayar Bavuudorj, Director Cooperation and Marketing; Dr. Haruhiko Nishiyama, Honorary Professor; and other representatives and students from the Institute. Others who graced the successful event were Minoru Kikuchi, Minister-Counsellor of the Embassy of Japan in Mongolia; Bolorerdene Tseren, Vice President of EB Engineering, the co-sponsor of this project, as well as members of the press (TV and print) and Mitsubishi Electric and our company. The Institute of Engineering and Technology is a new college that was established in 2014 and has been providing education for developing human resources based on the Japanese technical college system. Established for the purpose of nurturing engineers capable of being active in a wide range of industries both at home and overseas, the Institute offers both theoretical education and practical learning as a contribution to the country’s industrial growth. The Institute is the second college in Mongolia that the Mitsubishi Electric Factory Automation Systems Group has donated equipment to, following on from MUST (Mongolian University of Science and Technology) in 2017. The company jointly operated a booth with our local distributor, Progressive Engineering Corporation, at the Dhaka International Textile & Garment Machinery Exhibition (DTG) 2018 held at the Bangabandhu International Conference Center (BICC) in Dhaka from February 8 to 11, 2018, showcasing Factory Automation Systems Group of Mitsubishi Electric Corporation equipment (PLCs, inverters, HMIs-GOT, and AC servos) and power distribution and control equipment (breakers and magnetic contactors). The atmosphere within the booth remained upbeat throughout the event, attracting a large number of visitors. DTG 2018 is an international exhibition for the textile and garment machinery industry in Bangladesh, and this year represented the 15th time that it has been held in Dhaka. The exhibition was participated by approximately 1,100 companies from 36 countries around the world and was attended by around 38,000 visitors, including those from overseas. This represented the second time that we have operated a booth showcasing Mitsubishi Electric equipment at this exhibition, following on from 2016.